Home / Products / Candy / Nuts / Jordan Almonds Assorted, 1 lb. Jordan Almonds Assorted, 1 lb. 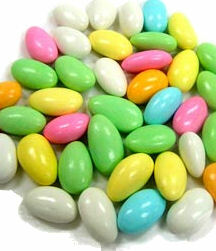 Fresh almonds with a sugar coating, Jordan Almonds are a favorite for wedding and baby shower favors. We use a super fine grade Jordan Almond. These quality almonds have a thinner shell, with less sugar and more almond. Approximately 120 almonds per pound. Sugar, Almonds, Flour, Dextrin, Corn Syrup, Certified Flavors, Certified Color (Yellow Lake 5 & 6, Red 3 & 40, Blue Lake 1 & 2), Titanium Dioxide and Carnauba Wax. May contain Wheat, Milk, Peanuts, Tree Nuts, Soybeans and/or Eggs.